A grand display piece with scenes of the life of Julius Caesar. Large vase with two double serpent handles. Earthenware, covered inside and out with a presumed tin-glaze. Painted, on each side a medallion supported by putti with cornucopias and satyr-putti. Each medallion has a scene of a Roman soldier and an emperor(? ), in classical architecture. The rest of the vase is decorated with grotesques. Round the rim a leaf-motif. The foot of the vase is a 19thC replacement. The reference, in view of the coincidence of date, seems likely to be to the drawings for the “Spanish Service”. Whether or not the original drawings were in the event ever reclaimed, copies were made and the designs were available to maiolica painters in Urbino for some decades afterwards. The iconography of this service was chosen to be appropriate for a royal gift, dealing with the triumphs of Julius Caesar. Paolo Mario’s letter says the wording on the reverse of the pieces was dictated by the Duke of Urbino’s secretary, the humanist Girolamo Muzio Giustinopolitano, and he may have been also responsible for the choice of subjects. Some of the subjects from the service are from Caesar’s own “Gallic War” or “Civil War”, and others are from Dio Cassius. The subjects of most of the more ambitious pieces belonging to the series focus on triumphal events, and seem to have been included as part of a series of triumphs in celebration of Caesar’s victories; but there are numerous smaller scenes of episodes from Caesar’s campaigns in Gaul. Many of these seem to be the work of Taddeo Zuccaro’s younger brother, Federico, and have been assembled in an article by Timothy Clifford. The two designs on WB.62 are not listed by Clifford, but were probably part of the series. The design with the man in a hat on the left recurs on a plate in the Museum für Kunsthandwerk, Frankfurt am Main, and on an albarello at Ecouen. Neither it nor the design on the other side corresponds exactly to any of the designs published by Clifford, but they are clearly of the same type; the vase therefore seems to record two unlisted designs by Federico for the Spanish service. There are no pieces known to us that can be definitely said to have formed part of the Zuccaro service actually sent out to Spain in 1562 – either because of a Spanish Royal provenance or through having Spanish Royal arms or emblems. The service was in all likelihood decorated with white-ground grotesques around the Julius Caesar figure subjects. There is evidence that the workshop of the Fontana family, and in particular Orazio, was responsible for the greater part of the high-quality white-ground grotesque production of the 1560s; and Bernardini Baldi, writing at the beginning of the 17th century, attributes to Orazio a service made for Guidobaldo to present to the King of Spain. However, no dated pieces from the 1560s are marked as products of the Fontana workshops, nor have any been positively attributed to painters who are known to have worked for the Fontana. Vasari, writing not long afterwards, stated that the “Spanish Service” was made in Castel Durante, which conflicts with Caro’s statement that the service was made in Urbino and the specific statement of an unknown source cited by Pungileoni in 1828 that the service was designed by Taddeo and made by Orazio. It may be that Vasari had heard that Orazio or Guido Fontana, whose family was from Castel Durante, had received the commission, and that he was confused by the family name “Durantino”; or it may be that in fact it was the practice of the Urbino-based Fontana workshop to sub-contract work in Castel Durante. The weight of evidence is that the original “Spanish Service” was the work of the Fontana family workshop. Orazio is recorded to have split his business from that of his father, Guido, in 1565, and is known to have been active in Turin the preceding year; there is not sufficient evidence as to how the family workshop or workshops in Urbino may have been managed in 1560-2 for any distinction between Guido’s and Orazio’s artistic responsibility in this period to be made, although one may guess that white-ground grotesques were a speciality of Orazio’s. 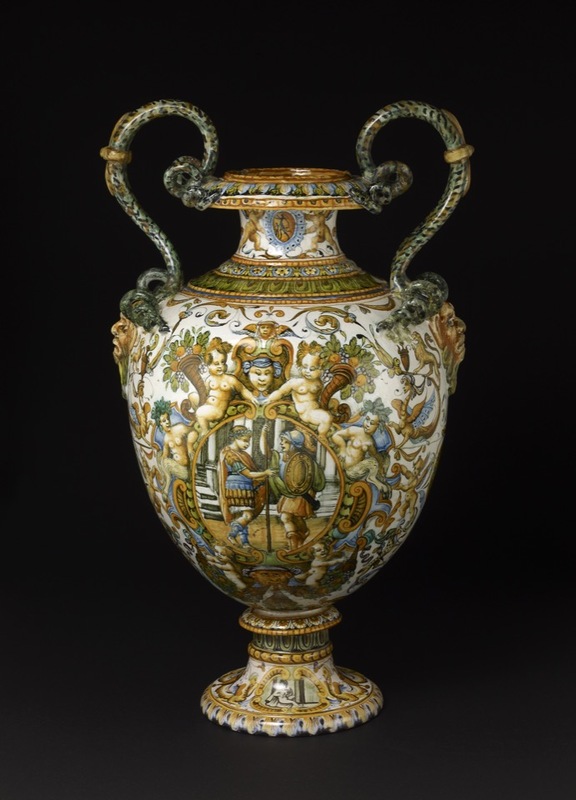 In view of the apparent collaboration between Orazio Fontana and Antonio Patanazzi from the early 1560s onwards, the attribution of any specific example of white-ground grotesque-painted maiolica, except the few marked ones, is risky; to distinguish “hands” in grotesques is very difficult. The Zuccaro drawings were much copied and continued in use in Urbino maiolica workshops at least until 1585, the date on a plate now in Pesaro. In 1580 the workshop of Antonio Patanazzi (who died in 1587) applied them to some jars from the pharmacy series now at Roccavaldina, Sicily. In Ferdinand Rothschild’s display in the New Smoking Room at Waddesdon Manor, the jar was given pride of place in a specially designed set of shelves over the fireplace. Dora Thornton, 'A Rothschild Renaissance: Treasures from the Waddesdon Bequest', British Museum, London, 2015, pp.150-155.